This month, I’m doing a series on how moms can use their tax return to start a business from home. This first interview is about making money with Rover. If you’re unfamiliar, Rover.com is like the Uber of dog-sitting. It matches pet owners with caretakers. Pet lovers go to Rover.com to find someone trustworthy to pet-sit while they vacation. Or, to walk, feed and love on their dog while they’re at work. 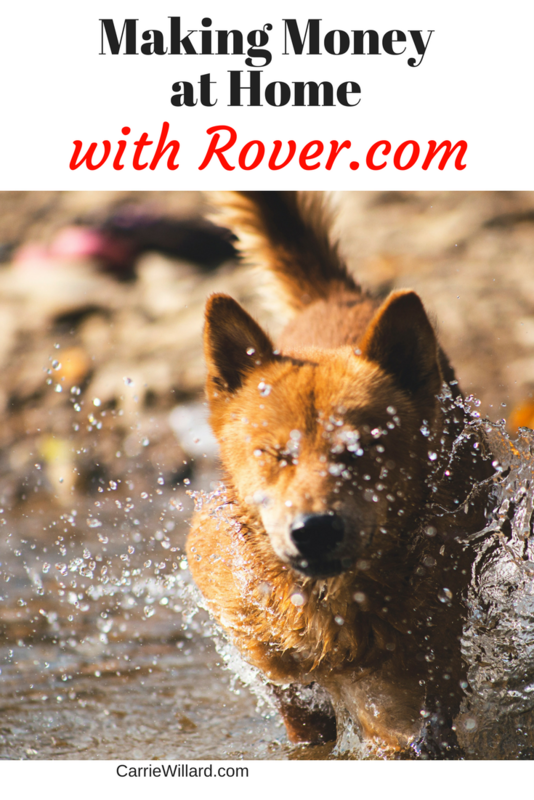 A good friend of mine uses Rover.com to run her pet-minding business from her home. She uses Rover to find reliable clients and assure payment. She was very generous in answering my questions here to benefit others who might be interested. How much money does it take to start a Rover business? Signing up for a Rover account is free, however background checks are mandatory. Background check fees range from $10-$35 based on the detail they need for the services you are providing. For example, some sitters offer drop-in services which provide them access into their clients’ homes. Rover.com is your main advertising engine. They also provide insurance coverage for your client’s dogs and property damage or injury that could occur while you provide care. For this they take 20% of your sitting fees. Those come out the back-end, so they only get paid when you do. They take their portion and then send the rest to you via Paypal or check, so upfront costs are minimal. There are optional costs for marketing materials provided by Rover. They have everything from car magnets/decals to yard signs and door-hangers, to help promote your business. At a minimum, I suggest purchasing business cards ($15 for 250 which is plenty to start) and pass them out liberally. I leave them on coffee shop community boards and offer them to people I see around town walking their dog, at the vet, pet store, etc. The business cards have a promo code on it for NEW Rover customers for $20 off their first stay. In addition, I provide a couple cards in a handwritten thank you note I give to each client when they pick up their dog after their stay. Although the discount won’t apply to their next visit, I write in the card that if they were happy with my services I appreciate reviews and referrals. Many are likely to pass that card on to a friend. You can use whatever thank you notes you want, but I did splurge and purchased Rover Thank You card stationery ($18 for 25) because I wanted to take advantage of the Rover branding. I do not supply the cards to repeat clients – only at their first visit. It takes a while to build up 25 different clients so it’s ok to start with just a small pack. Some other costs you may incur: BABY GATES! If you already have kids, you may have lots of these already. But depending on the set-up and layout of your house, you may need more. I purchased metal gates (some of the dogs chew the wood), those with bars (the metal lattice can be climbed), taller gates (shorter can be jumped), those that attach to the wall (vs. tension rods that can easily be knocked over), walk-through gates instead of step-over for my kids to get through, etc. Your Rover business – a family affair! Some of these gates can cost a pretty penny so I always keep my eye out at kids’ resale stores and yard sales. Bargain Hunt, Big Lots, and stores like these can also have surprising deals on gates, as well as crates. I HIGHLY recommend having at least one good size dog crate, as not all clients have their own and it is inevitable you will end up with a dog who needs to be crated at some point during their stay. If you plan on boarding multiples, I’d get at least two crates. Go larger instead of smaller to accommodate larger dogs as well as smaller ones. Keep your eyes out for deals and ask friends if they have any they want to get rid of to pass them your way. There are lots of other things you can invest in to round out the business but these can be purchased over time as the need arises based on your clientele, volume, and the services you offer. For example, I have extra leashes and collars, bark collars, beds, dog shampoo, flea and tick meds, food/water bowls, chew toys, e-collars, nail trimmers, aerial trolleys, outdoor pens, bitter spray, dog whistles, doggy diapers, poop-scoopers, small carpet / upholstery cleaner, ‘child-proofing’ hardware to keep dogs out of chemicals underneath the kitchen sink, pyramids of paper towels, disinfecting cleaners, the list goes on and on – but I run a pretty busy kennel operation with a high-volume of dogs, long-term stays, repeat regulars, and allow dogs to have access to areas of my house. The potential for over-spending could be high if you are an impulse spender and dog-lover. In the end though, the background check is the only thing you HAVE to pay for to get started – everything else is either optional or as needed. Take a few clients to get a feel if its something you really want to do and what kind of clients you are going to take before you start shelling out cash to build your business. Who is a Rover.com business right for? This business is right for stay/work-at-homers who love dogs, whose family loves dogs, and whose other pets (if they have any) loves dogs. Guest dogs are unpredictable. No matter how wonderfully behaved owners will insist their dogs are, there will be accidents on the carpet or wood floors. Personal affects get chewed up. Patches of lawn destroyed. Sleepless nights with the occasional whiners and barkers. And lots and lots of dog poop to pick up. Your love of animals must prevail over these hurdles! 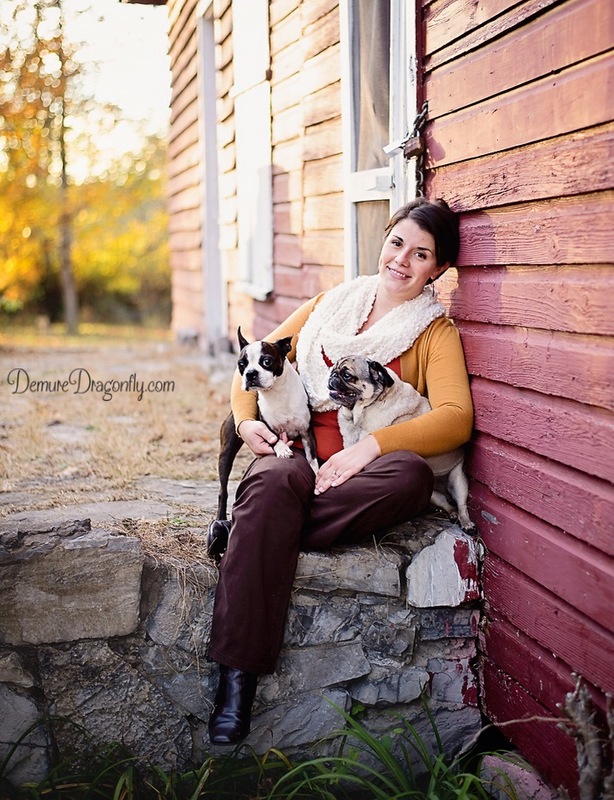 Sitters must be extremely knowledgeable when it comes to canine behavior and training. And they cannot be afraid of dogs. They must be able to jump in calmly and assertively to break up any scuffle if needed. This job is great for someone who wants to pick and choose exactly when they work. However, knowing that to build a large clientele, you have to accept some inconvenient stays every once in a while. A Rover business is truly a family business! Once having accepted a job though, sitters have to be ready and able to dedicate themselves to their guest dogs’ routines (walks, feeding times, bathroom schedules, quirks, and behavioral issues). They also must be able to juggle the routine of the human household simultaneously. For this reason, I suggest traditional boarding be done by stay/work-at-home individuals. Whereas drop-in walkers and feeders (or weekenders only) might suit someone who has a job outside the home better. The house must also be conducive to having dogs. So, some forethought needs to go into how they will access the yard if they need to go to the bathroom (doggy door vs. you letting them out)? Is your yard fenced and in good repair? Do you live on a busy street? If you rent, do you have permission to have pets at your house? 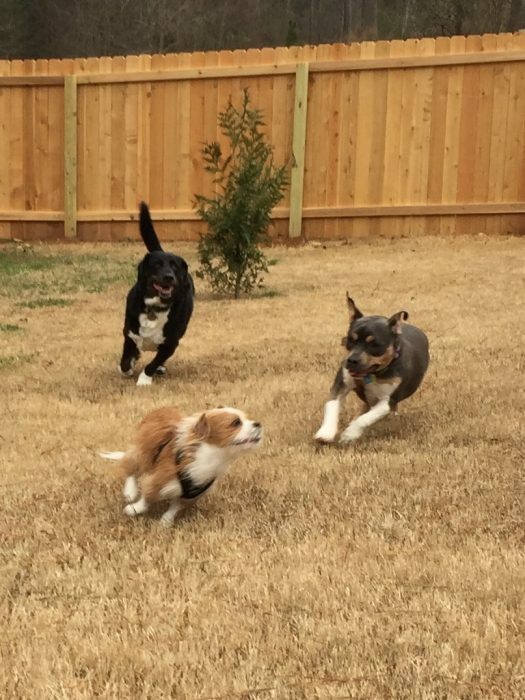 Do you have a strict HOA you’ll have to deal with if someone complains about barking? Is your home set-up so that you can keep an eye on the dogs at all times, even if they are out in the yard? Another big criteria – you have to be able to present yourself – especially your home and yard – with confidence. Clients come to your house for meet and greets and you have to be an engaging, friendly host. Your home must be inviting. It shouldn’t smell like a kennel. Is it clean and free of obvious hazards? The yard mowed, etc? My house is cleaner than it ever was before I started sitting because I am constantly hosting meet and greets! As with any business, you need to be able to market yourself. Setting up an attractive profile page with great photos is easy to do on Rover. Just look at it with a ‘customer’s eye’. And remember, pets are family. Who would you leave your “kid” with? Make sure your profile presentation is appealing! What’s the income potential with Rover.com? Income potential varies based on the services you offer, the pricing structure you set, the number of dogs you take at a time, your availability, and your geographic location (demand, competition, convenience to your client base). The regular weekend and occasional vacation sitter can bring in $200-$300 extra a month (after fees) if you only take one or two dogs at a time. If you want to make $600 or more (take home after Rover takes their fees) you’d have to average at least one stay every day of the month (assuming an average stay price like $25 night). On holidays and vacations, though, you can rake in the dough if you take multiples for longer periods of time. I had a property that allowed me to to have 10 dogs at a time, for a 4-night holiday weekend. After Rover fees, those 4 days brought in $800. But it was a 3-ring circus at my house, and not everyone has the set-up for that volume. Look at the sitters in your area to determine your fee structure. Determine how many days a month you’d like to be sitting, and how many dogs you are willing to take at a time to loosely figure out your ideal income. For me personally, I have the clientele base now so that I have at least one, if not two, dogs at my house nearly every day of the month. I can bring in $500 month easy, even with limiting volume. I end up turning down quite a bit of business as well. What do you love most about your Rover business? 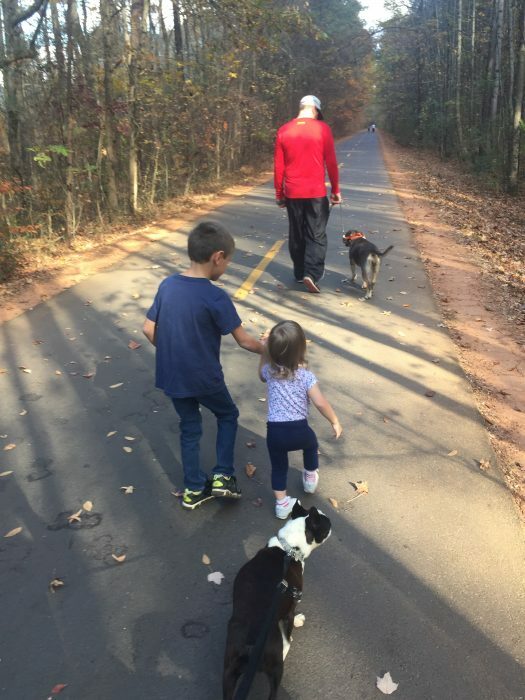 I get to stay home with my kids – both the two and four-legged ones – and earn money in the environment of my own making. 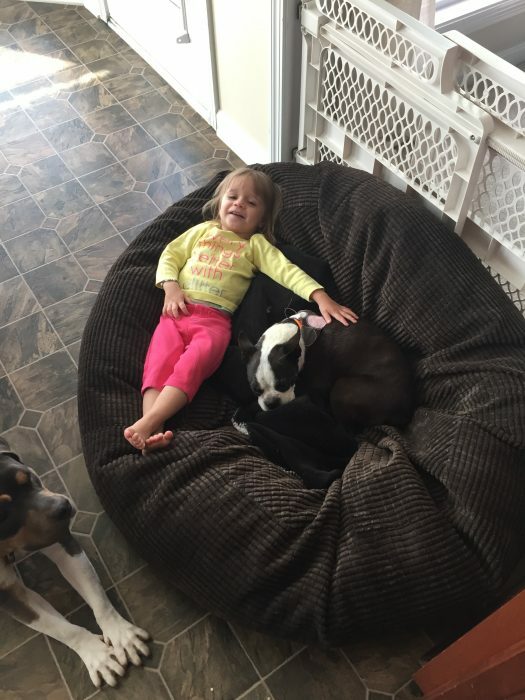 It allows me to teach my children how to care for animals properly and socializes my dogs simultaneously. I’ve met some amazing dogs. It’s fun to keep things switched up with new breeds and personalities. So, there is never a dull moment! Finally, its very fulfilling to help out fellow pet-parents when they are in need of a safe place for their fur-kid to stay when they can’t be there themselves. 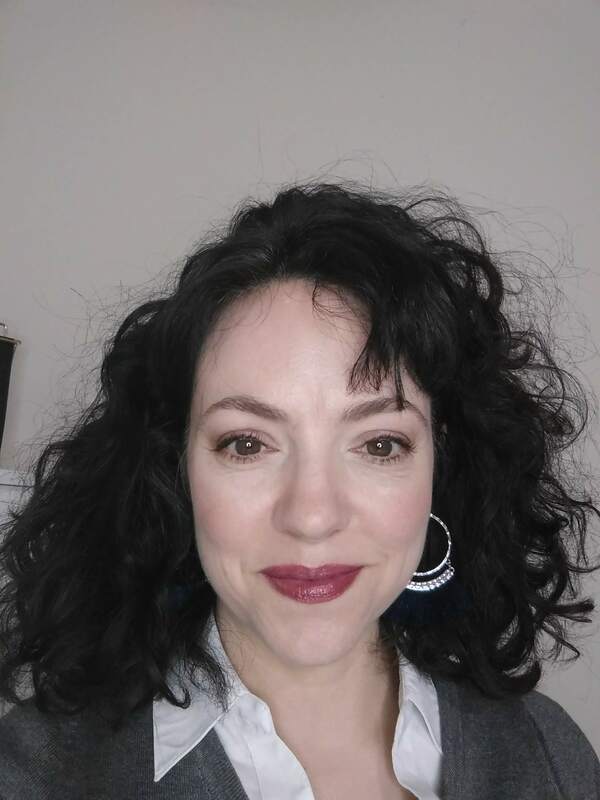 Thanks again to Lacy for answering my questions about making money at home with Rover.com! I love her honest answers. Every business is not ideal for every person. Anyone who insists on that “anyone can make money in this business” has a conflict of interest and is trying to sell you something. Think making money at home with Rover.com is for you? Visit Lacy’s Rover page to learn more. Notice how she markets herself on her profile page. If you have any questions about making money with Rover, please leave them below. And thanks Lacy for your thorough answers on all things Rover! I think this is a great way to make some money for those who really love dogs, and need flexibility in their work schedule. Thank you. I’m in the process of signing up with Rover. I am starting out with house sitting but am considering boarding dogs once I have things better set up in my home. This answered a lot of my questions.